There’s no secret that what consumers value most is changing. Digital disruption has brought with it market realities that have changed how customers become aware, browse, investigate, purchase, use, complain and/or become loyal to a brand. Contextual customer experiences -- the merging of digital content, interfaces, technology and even physical spaces -- now have reign. These experiences are becoming the differentiating aspect of marketing a product or service. But although consumer values and buying habits have changed, the reality is that, in most cases, marketing processes and strategies haven’t changed. Many businesses are still organizing and scaling their marketing processes in the same way that has been around for 80 years. However, consumers simply expect an always-on 24/7/365 consistency through any channel they desire to interact on. 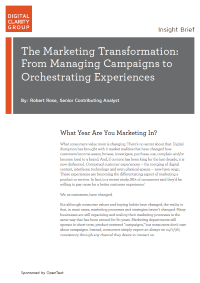 This brief explores how to manage a cohesive, connected and consistent portfolio of customer experiences that integrates everything the brand does (physical or otherwise) to help create the total customer experience.